It’s really starting to scare me. No joke. I get distracted so easily. It happened the other day, time after time after time, as I worked with my students in the classroom. I work with many students who have attention deficits. And behavior issues. And emotional needs. And learning disabilities. And physical challenges. And I love my job. But the mix lately has been difficult and I feel like the dog in the movie “Up” (see link below) a myriad of times each day. Needs and goals and distractions and the daily stuff of life can feel like a hindrance in educating young minds…or of even just completing simple tasks in a day! I try to be empathetic to my students needs, and have become quite sympathetic with the ones who struggle with attention deficits, because it appears as of late that I have a few attention deficits of my own! Like a dog who sees a squirrel and gets totally often track chasing that squirrel down, I daily chase a lot of diversions on my own, for sure! Please take a moment to watch the clip and you’ll get what I mean… It’s so cute and makes me laugh every time I see it. So, the little dog gets a bit distracted. I mean, what dog wouldn’t get totally distracted by a squirrel? It’s just in their nature to have that heightened sensitivity to the presence of a squirrel, and the urge to just….chase it! Well, life is full of distractions, or squirrels, if you will. Full of them! And sometimes as moms, teachers, caretakers, ….as women… it’s just in our nature to have that heightened sensitivity to attend to the needs of those around us. We’re aware of the need, aware we can help solve the problem, and so we …..chase it! And some of those distractions need to be addressed and handled. But some of them? They just need to be seen as distractions that we don’t need to chase. Have you ever really seen a dog catch a squirrel? I’ve seen lots and lots of dogs chase them, but I have never seen a dog catch one! Squirrels are speedy and elusive and dogs can expend huge amounts of energy and time chasing them to no avail. It’s like running on a hamster wheel…there’s lots and lots of effort, but no completion, success, or finish line. Distractions are the same way. So often, the more we give way to distractions, the more distractions we have. Like dogs running down a trail, we chase those squirrels wherever they go and then we have no idea what in the world we were working on before the SQUIRREL effect diverted our attention. I do have a full plate. I know that. But I’m usually pretty able to compartmentalize. I can multi-task while mentally or emotionally putting things on the back burner until I can deal with it wholeheartedly. Raising 6 children (who were born in 8 years, no twins…) helped me to really hone that skill to perfection! But lately, I’ve been losing that a bit. I don’t know if it’s this time of life. Yes, ladies, I recently had my 50th birthday, and the gray hair, the fatigue, and …..the distractibility has just really popped up in my life in a big way. They say this period of life can make women be a little bit more ‘scatter-brained’, and I’m thinking that the diversions my brain takes are supportive evidence of this fact. But whether it’s the level of activity around me, the season of my life, or the habits I’ve formed, I really have been trying to be…intentional. To be intentional about what I do when i wake up. To be intentional about the things I do in a day. To be intentional in the way that I pursue and pour myself into the relationships around me. Yes, I want to be intentional. Nobody in their right mind would put on their ‘to do list’ to run around wasting time and wearing myself out chasing squirrels. Nobody. but, my daily routine has included quite a bit of that. To be intentional, I need to know my purpose and stay on course. I love the word intentional because it connotes purpose without rigidity. Life is so full of distractions, hindrances, and rabbit trails (or squirrel trails, if you will!) of the heart, mind, and body. But so much of life is how we respond to those distractions. And that is the key. And in order to respond well to the distractions, I need to have more of a big picture mentality of what really matters. Jesus was the master of not giving in to distractions. There were demands and needs and pleas all around him. He was constantly pursued, misconstrued, rejected, judged, and totally misunderstood. He often said “for those who have ears to hear”, and I don’t doubt that he was routinely surrounded by many who just didn’t have “ears to hear”. He would speak the words of Truth, and move on. He focused on purpose. He rested. He was intentional about having some time alone. He was intentional about having relationship. He was intentional about his time in prayer. He could rest in a boat in the midst of a huge storm. The very real distractions of wind and waves weren’t his focus. He knew they were all in His Father’s Hand. And He knew He was. He was true to His purpose even to the end, the bitter end when he prayed alone in the garden and was forsaken by those who had left all to follow Him. He was forsaken by all but One that night, but then was obedient unto death even when that he hung on the cross and His own father turned from Him. He was obedient, intentional, purposeful unto death. He knew His Purpose. Because He knew the big picture and His purpose in it, he didn’t get caught up in all the details or dwell on the difficulties. He knew that the end of the story wasn’t the cross, but the Resurrection. And His intentions were the momentary, daily, yearly, and lifetime steps that kept Him on the path of purpose. Well, once again, this post is full of plenty of diversions of sorts. Sorry. I obviously have a long way to go in my ability to write directly and succinctly. …What might distract you is an important detail to me!! I’m working on being more ‘abridged!” But that’s part of the multi-tasking person God made me, and the funny thing is, when you’re aware of what’s going on around you, you’re aware. Aware. And that’s a good thing. If I weren’t so keen on distractions, I don’t think I would’ve ever even gotten the above photo of the squirrel. After a long day at work, what was the very first thing I saw as I walked outside into the parking lot? 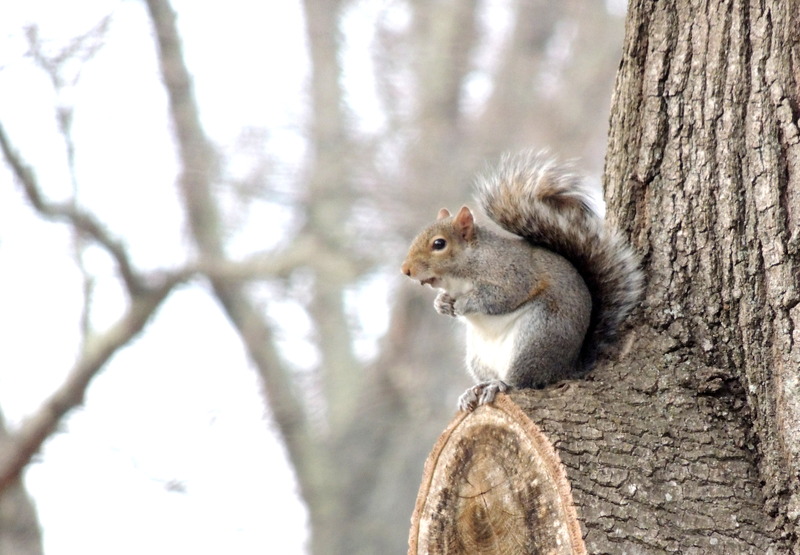 a…..SQUIRREL!! And as i got into the car, I grabbed the camera and focused the lens on that little critter sitting in the tree. Usually squirrels are fairly jittery. if they know you’re watching them, they’re off and running. But even after I positioned the car to take a better photo, the squirrel just stopped eating, looked my way, and then proceeded to eat whatever it was that it had been eating. If a squirrel can be calm with a huge distraction of a car and a woman with a camera 10 feet from the tree that it’s sitting in, well, then maybe there’s hope for me as well! So here’s the thing. As believers in Christ, we are called to be calm in the midst of the distractions. Trusting. Resting. Knowing that the End of the Story is Good. And my part in it? These steps along the way that are often so full of tasks and urgency? Living in them and responding to them is so different than being run by them. Because? Because I know that ultimately, my relationship with God and faithfulness to His call in my life has to be the stake I’m centered on. Like a dog that feels like it needs to chase every whim, I could be constantly out of breath with the trails I take. Praying that the way I respond in the ins and outs of all of the joys and messes of daily life are those that keep me moving forward toward the path that God has for me. I love that nothing is wasted in God’s economy. Nothing. Not even distractions.They can be the very tools He uses to shape us and prepare for what’s ahead.